This interactive presentation contains the latest oil & gas production data from all 12286 horizontal wells in North Dakota since 2005, through February 2017. With good weather in February, and frozen roads well accessible, oil production in North Dakota rose for the 2nd consecutive month, by 53 kbo/d to over 1 million barrels per day again (1034 kbo/d). The chart shows that even production from wells that started before 2017 rose both in January and February. This abnormal situation was caused by wells being brought back online again after winter shut-ins. In February 62 new wells started producing, the same number as in January. Probably production will take a hit in March and April, with road restrictions in place. From the “Top operators” tab we can see that, since September 2016, all the 5 largest operators in North Dakota increased production. Only about half the number of wells started production in 2016, vs 2015, but their initial performance was clearly better as the plot reveals. An important reason why the wells here, and in the other basins, have showed higher initial productivity in recent years, is that completions have gotten bigger in volume. Where the average completion in North Dakota used 2.2 million gallons of water in 2012, this rose to 4.4 in 2015, and 6.3 in 2016. In almost all the other states that I cover, this increase was even larger. You can see more recent and detailed results if you select “quarter” or “month of first flow”. The 2nd overview (“Cumulative production ranking”), provides the exact cumulative production for each of these 12286 horizontal wells, as well as their location. In the “Well status map” tab you’ll find the status of all these wells on the map. After only selecting the status “3. 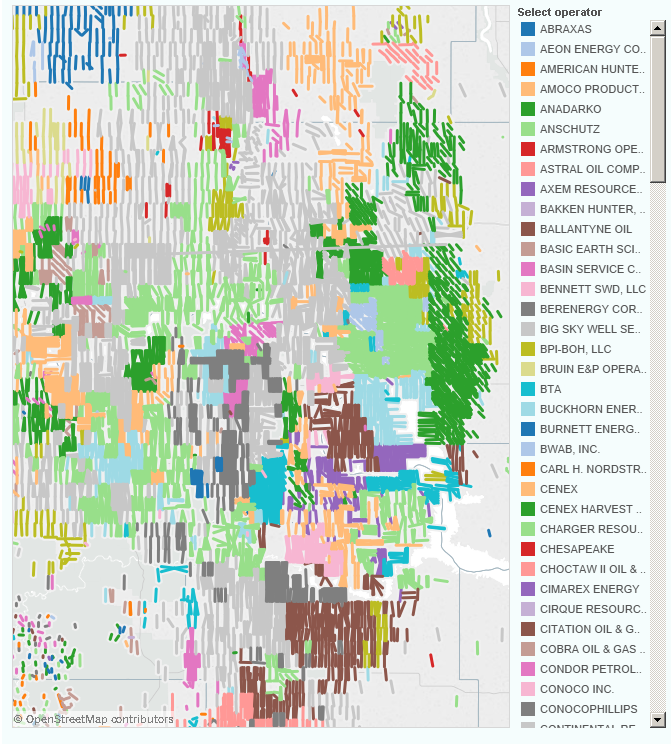 First flow”, you’ll notice that apart from 2 new wells in Divide county, the other 60 new wells in February were all completed in the core of North Dakota. I plan to publish another update on Pennsylvania in about 2 weeks. Once West Virginia releases its 2016 production, I will have a post on this state as well for the first time. Outstanding effort, as always. Thank you. Quick question which is a followup to my/your comments on Mr. Patterson’s site, regarding production data from re-frac’d/re-stimulated wells … Quite awhile back, I thought you made a comment regarding the ‘bump’ in output from older wells (for unidentified reasons) and you would treat that data somewhat differently in your presentations. I may be misinterpreting and/or mischaracterizing your statement, but my question is, do you continue to incorporate all these numbers into your graphs and charts? Specifically, Marathon’s 2011 and earlier wells’ profiles may be somewhat instructive as they are the recognized leader in Bakken refracs and downspacing. This infill regimen is bringing a lot of problems relating to inter well interference and unconventional operators everywhere are scrambling to find solutions. 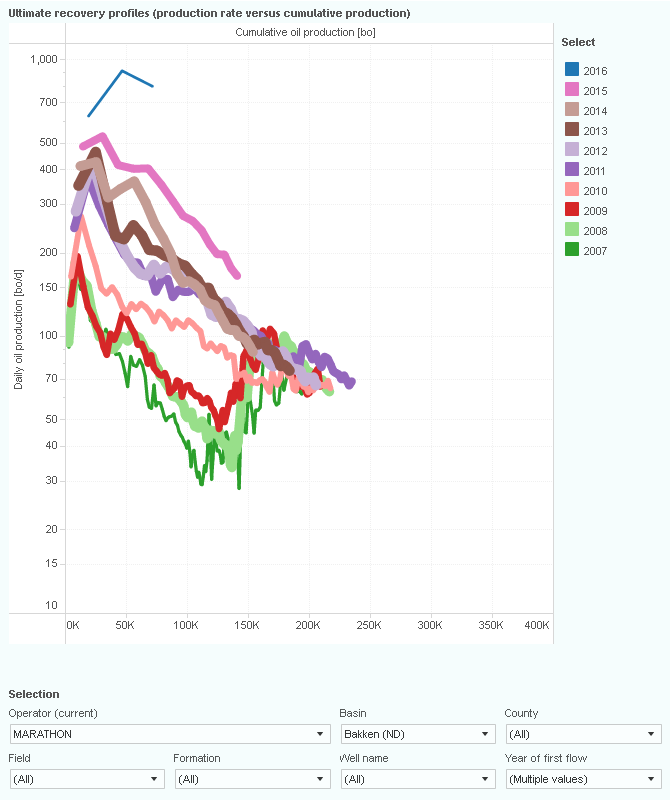 Nonetheless, increased formation pressure from new, offset wells can increase older wells’ output, as Marathon’s profiles show. > do you continue to incorporate all these numbers into your graphs and charts? Correct, in all these interactive presentations, I always try to include all horizontal wells. Sometimes I exclude a few not-so-relevant counties (like in Colorado/Wyoming/New Mexico/Montana), or I have to exclude wells as it is not possible to reliably estimate their production (for 7% of the Texas Permian wells). However, I do not exclude wells that have been refracked. For North Dakota, I belief that all horizontal wells that have started production since 2005 are included in the above presentations. I have at several occasions posted static graphs, typically in comments, that showed certain results specifically with, or without, refracked wells. As refracking typically greatly increases production, it has quite a big effect on the average performance of older wells, even though only a relatively small number of wells have been refracked. This is very helpful. Have you found that the production data approximates reported data by the company? Am I correct in assuming that the numbers reported here gross numbers by the operator and not adjusted for their working interest? Thanks very much. Is there a way to compare average production per well by vintage? A lot of operators have talked about longer laterals and more proppant improving their well results. I wanted to see if the well results support those claims. I can divide the cumulative production by the number of wells to get a per well result, but I wasn’t sure if you provided per well results already. Unless marked with “Total production”, all the graphs in these presentations show the average results for the selected group of wells. For example, the graphs in the “Well quality” and “Ultimate recovery” overviews, already show the average performance of wells by vintage, which I belief is what you are looking for. You can use the filters in the selection area to narrow down your selection. I’m using the well quality function now. For North Dakota, I’ve now been able to visualize the actual positions of all the horizontal laterals, see the following link for the interactive version, and the picture below for how this looks like. Note : if you follow this link, you can use the map options (which become visible if you click/tab on the left top of the map), to zoom in/zoom out, and move the map. Thank you for your question. For me it is always helpful to understand where the presentations are confusing/counter-intuitive. Therefore, just shoot any questions you have. > If I highlight the first data point, it shows 736 wells, 1 month of production, and production of 9,805. Is this to be read as of wells that had first flow in 2016, in the first month these wells produced a total of 9,805 barrels of oil? Indeed, in ND there are 736 wells that started in 2016 and have produced at least 1 calendar month. The average production for all these 736 in their first calendar month on production was 9805 bo. As you can see in the top graph, this is because the average production rate for these 736 wells was 321.6 bo/d during their first calendar month on production. We now have production data for February 2017; so all the wells that started in 2016 have at least 3 calendar months of production (the ones that started in Dec have now Dec+Jan+Feb = 3 calendar months). Therefore, you’ll see that up until month 3, the number of wells is still 736 wells. After that, it drops off, as fewer wells from this group have already reached those extra months on production. > By month 14 is the production number oil that is coming from wells that have been online for 14 months only or all wells started in 2016? So only the wells that started in Jan 2016 already reached those 14 months on production by February 2017, and therefore this data point only reflects how these Jan 2016 wells have performed so far. You’ll see that from 3 to 14 months on production, the number of wells that are included becomes smaller. This is also visualized by the thickness of the curves. As not the complete population have reached those later months yet (> 3 months on production), there is some danger in using that data (as it can still shift up or down as more wells reach that age). Therefore, in general, the last 11 data points in these curves are incomplete if you show the wells by “Year of first flow”. In the “Ultimate recovery” overview these incomplete tails are hidden, as they otherwise would lead to distortions. That’s why you will see more recent data there if you switch to quarter or month of first flow.